M DISC BD-R 25GB 4X White Inkjet Printable Hub Printable - 25pk Spindle This item cannot be shipped to APO/FPO addresses. Please accept our apologies. BD-R DL 50GB 6X with Branded Surface - 25pk Spindle This item cannot be shipped to APO/FPO addresses. Please accept our apologies. Want to record HDTV programs or back-up your entire photo or music collection?� Verbatim offers BD-R DL media that stores up to 50GB of HD content. Using blue-violet laser technology, this Blu-ray disc can handle up to 1080p resolution and multiple audio formats � perfect for HD video and surround sound. 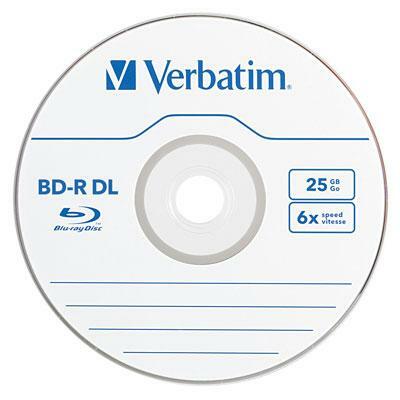 And, all Verbatim Blu-ray discs are treated with a super hard coat to prevent scratches, resist fingerprints and reduce dust build-up.� Compatible with the latest Blu-ray hardware like Sony, Pioneer, Panasonic and LG, the Verbatim BD-R DL media offers you high-capacity storage with the high-definition experience you expect. Disk Type: BD-R; Recordable Format: �Write Once� format�may not be altered once data is written to the disc. ; Capacity Range (Data): 50 GB; Maximum Recording Speed: 6x. 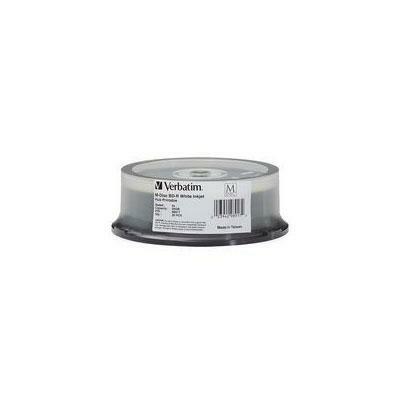 BD-R 25GB 16x 25pk spindle... 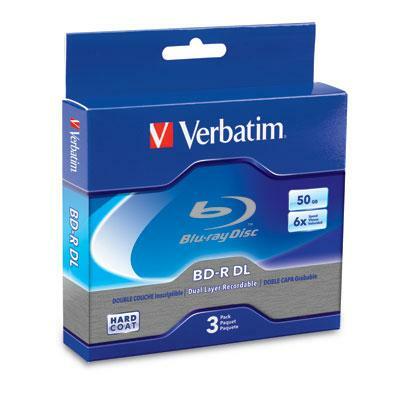 Need to record HDTV programs or back-up your photo or music collection Verbatim offers Blu-ray single-layer media that can store up to 25GB of HD content or data files. Using blue-violet laser technology these Blu-ray discs can handle up to 1080p resolution and multiple audio formats -- perfect for HD video and surround sound. Super high-speed some newer drives support Verbatims 6x media as 8x 10x or even 12x. And all Verbatim Blu-ray discs are treated with a super hard coat to prevent scratches resist fingerprints and reduce dust build-up. Compatible with the latest Blu-ray hardware like Sony Pioneer Panasonic and LG Verbatim Blu-ray media offers you an amazing high definition experience right in your own home. Finally Verbatim BD-R 6x discs can also be written on 4x writers. This item cannot be shipped to APO/FPO addresses. Please accept our apologies.